Guns can be frightening, particularly for those individuals who have no idea how to use a firearm. In a recent Townhall video, one man reasoned that concealed carry in Washington D.C. was dangerous because "more people carrying guns means more opportunity for those guns to be used." Individuals employing the “more guns more crime” logic are using shoddy research as the basis for their claim. “If you look at information from the Justice Department, they have something called the National Crime Victimization survey. 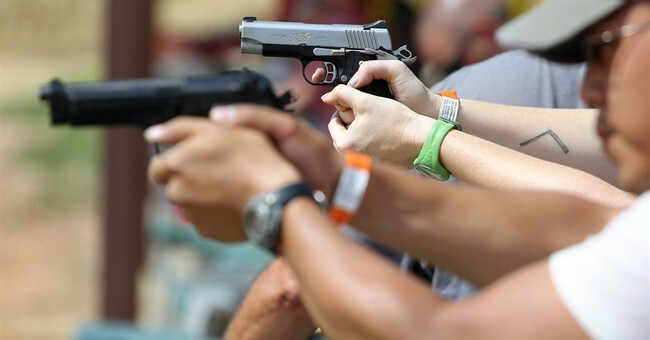 What you find is that guns are used in crime about 250,000 times a year.” John R. Lott Jr., economist, Yale professor, and president of Crime Prevention Research Center, told Townhall. The truth is that individuals with gun-permits are extremely law-abiding. Less than one percent of licensed firearm holders have had their permits revoked due to misdemeanors. During almost three decades, from October 1, 1987 to May 31, 2014, Florida issued permits to almost 2.66 million people. These permits have been revoked for firearms-related violations at an annual rate of only 0.0003 percent. For all revocations, the annual rate in Florida is 0.012 percent. The numbers are similarly low in Texas. In 2012 (the latest year that crime data are available), there were 584,850 active license holders. Out of these, 120 were convicted of either a misdemeanor or a felony, a rate of 0.021 percent. Only a few of these crimes involved a gun. Revocations and suspensions occur when people are charged with a crime, but only about 5 percent or less of these cases result in conviction and thus people are eligible for having their licenses reinstated. While 120 were convicted of a crime in 2012, 905 people had their permits revoke, for a total rate of 0.15%. Over the last five years that revocation data is available (2009 to 2013), the rate is slightly lower, 0.13%. For Michigan, overall revocation rate for the five years from July 1, 2010 to June 30, 2014 is slightly higher but still low, at 0.26%. News agencies rarely report prevented crimes, Lott pointed out. After all, the newsworthy aspect of the tale never occurred. Yet people with the right to carry are stopping crimes and saving lives. Here are just a few examples reported on Townhall: In Washington state, a bus passenger carrying a concealed weapon brought down a gunman. In Texas, an armed citizen prevented a man from mugging a woman’s purse. In New York, a pizza delivery man potentially saved his own life by being armed when thugs jumped him at night. It is no wonder that President Obama has a misconstrued theory on gun control, since he seems to hear about everything through the media. It is essential for policy makers, however, to recognize the full range of unintended consequences that could ensue from disarming citizens.